Still snowed in and entertaining the stranded! So I tried another Ellie Krieger recipe for a game day or appetizer dip option. Even though Ellie is a registered dietician and a very dedicated health nut, I still like her recipes! Anyway, I love roasted sweet peppers and, having 3 reds on hand, some crumbled feta cheese and a lemon I had earlier zested bald for a roasted chicken dish, I thought, "Why not?". I think you can use fresh or dried dill (remember to adjust if using dried), and since there are gluten issues among the diners, I substituted unsalted gluten-free crackers pounded to crumbs for the breadcrumbs. I really liked the end result of this dish and will do this one again - even when the weather is nice, which is why I want to share it. Good tasting & good for you! Crank up the broiler and place the washed red peppers on a rimmed baking sheet. Set the timer for 5 minutes and turn the peppers. Continue roasting and turning every 5 minutes for a total of 25 minutes,or until the skins are largely blackened. Then place the roasted peppers in a deep bowl, cover with cling wrap and let the peppers cool and release their skin. When they have cooled, all you need to do is slough the blackened skin off and rinse the peppers under cold water to remove any remaining black specks, if you are bothered by black specks. The stem and core will pull right out. You can slice the peppers and rinse or wipe the remaining seeds away. Plop the peppers into a shallow sauce pan (or your food processor). Add the minced garlic and salt paste to the peppers. Add the feta, breadcrumbs, lemon juice and olive oil to the mix. If using dried dill, add it now; if using fresh dill, wait. Ellie always uses a food processor, I am an immersion blender guy, so puree the whole shebang with either tool, it is a dip, after all. When pureed to your taste, taste for salt, adjust, if necessary, and then fold in the chopped fresh dill. Transfer the pureed dip to your serving bowl and granish will a bit of fresh dill or chives, if you have ithem, and/or a drizzle of olive oil. This is delicious and will be a go-to for parties for me. I needed a about half the oil, but may have just had especially juicy peppers. Add 1/2 tsp of dried red pepper flakes to the mix to liven it up - it also adds a really nice fleck of color to the dish. This works great if you make the dish a day ahead. Sprinkle a little smoked paprika on top before you garnish with the greens. This looks very appealing if you also drizzle a bit of olive oil on top. 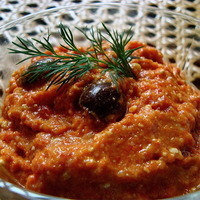 Mix a few pitted and diced Kalamata, or Alphonso olives into the dip for contrast, taste and texure. THIS IS EXCELLENT ON A BURGER!!! You will like this on either a veggie burger or a meat burger. What else can we do with it? Looking for suggestions. I don't rinse the peppers when peeling them. I don't mind a few little bits in there anyway and I don't like to lose the yummy juices, plus I can then use a little less oil. Well, I agree about the rinse - it's the fastideous cook's way to eliminate all particulates. The smokiness will come through, either way. It is a good dip. Let me know what you think.